Stefan Herheim, how were you able to let German history provide the framework of your Parsifal without thematising the Holocaust? German history certainly forms an important framework for my directorial concept, but I never impose anything on a performance that I don’t have the support for in the music. Or which doesn’t then support the theatricalisation of what I think a staging of the work should thematize. A central motif in Parsifal is that "time becomes space". That's why I chose to send Parsifal on a journey through time - from Wagner's time to the present day – thereby showing that the mythical and mystical aspects of this work are strongly linked to our own history. Our history influences our perception of reality and the way we approach Wagner's art today. At the end of the second act, when the action reaches its climax, I thematize National Socialism and, in so doing, Hitler's abuse of Wagner's work, as well as Bayreuth’s fatal coquetry with Hitler. The scene only lasts for a couple of minutes, but it’s the dramatic culmination of the drawn-out confrontation that takes place between Kundry and Parsifal. While these two are fighting with each other, various people in clothes from the 1930s hurry across the stage. They carry bags and personal belongings, and are clearly in flight, but choose to remain and follow what is unfolding between the main characters. It’s as if they see a clear connection between the outcome of this dispute and their own destiny, in a Germany heading for disaster. What do the refugees represent? The refugees represent the hope that the dispute can be settled, a hope that this kind of pride and totality, inconsistent with compassion and charity, will be defeated. 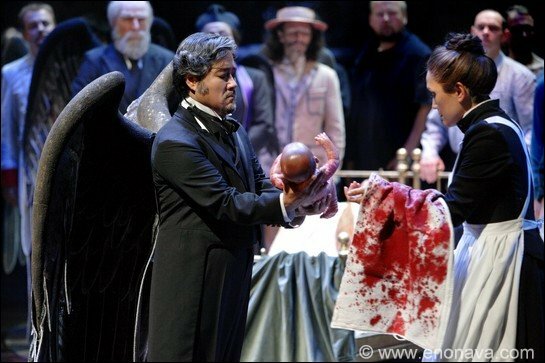 However, Parsifal condemns Kundry, who casts her enraged curse on Parsifal. At this moment, the stage rapidly fills with swastikas and SS troops. They drive away the refugees and shoot fiercely at them. With this, the persecution of the Jews and Nazism’s bestial extermination methods become quite evident in the space. This moment holds severe consequences for our own culture and for future tendencies to contextualize Wagner's art. 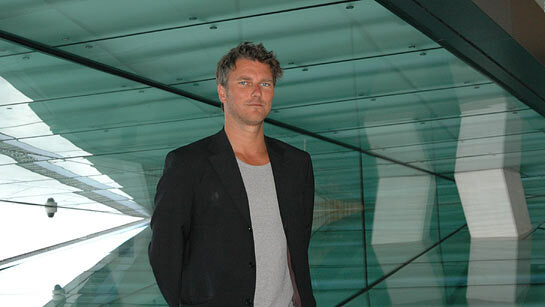 What makes the task of staging Parsifal different from that of other operas? What makes this work so special? Parsifal is a conglomerate of deliberations on mythological, psychological, theological, philosophical and transcendental themes. These revolve around the problem of guilt and dramatize the precondition for man’s salvation. Parsifal has been described as Wagner’s final farewell to the world and with it´s many critical contrasts and enigmatic contradictions, this work stands out as one of the 19th century’s most eccentric attempts to create the perfect, absolute work of art. Wagner gave Parsifal the term "Bühnenweihfestspiel", and forbade performances outside the festival house in Bayreuth. Both the name and the monopoly were attempts to protect the work against production practices that prevailed in European opera houses in the 19th century, and which Wagner hated. This naturally enhanced the work's elitist and sacred aura, and enabled the obscure Wagner cult that already characterized the Festival to gain even more ground. The composer tailored Parsifal to the special acoustic of Bayreuth, where the sonorous orchestration is fully realised. 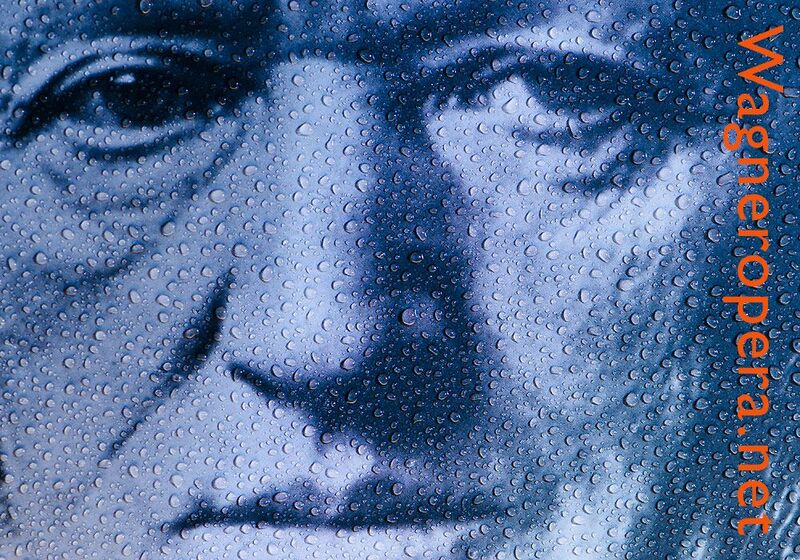 From a literary perspective, Wagner's text cannot be compared with the innovative power that pervades his score. The music is far ahead of its time. The verbal language, however, is bombastic and reactionary with many bizarre phrases and a kind of sickening passion that can delude the listener. 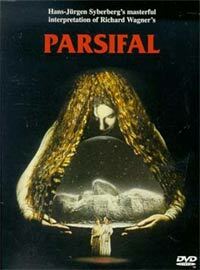 What was the starting point for your concept of Parsifal? My starting point was to highlight many of these things without undermining the work's fascinatingly theatrical, seductive power: Parsifal is many things, but it is primarily highly effective musical theatre! I’m also fascinated by the fact that the traditions and myths surrounding an art work can grow so densely around the work itself that it is difficult to see the author’s original intentions. The use and thus the misuse of art clearly reflect society’s cultural, social and political trends. I like to deal with this in my productions in order to break with the notion of opera as something untouchable, fixed, elevated and museum-like. Above all, opera lives through the audience’s need to see itself in the artistic reality that this art form suggests – in the here and now of a performance. This also applies when opera mutates to the kind of art-religion that is associated with Wagner and Bayreuth. What dangers do you associate with the art-religion you refer to? Every religious faith is in constant danger of perverting itself. When faith becomes institutionalized and religious dogma demands submission, it soon ceases to be about faith, and turns into something compensating the feeling of powerlessness. Faith is not knowledge, it begins where certainty ends, and a soul that finds a "truth" that doesn’t tolerate a question mark is not a seeking, but a troubled soul. When the means are made sacred, faith is corrupted. Ideology is therefore often the result of a spiritual resignation. The same mechanisms interfere in the relationship between love and power, which Wagner also continually thematizes in his works. Is that why you find Wagner so fascinating? Yes, but when dealing with Wagner, it’s necessary to distinguish between Wagner's work and Wagner as a person and child of his time. As a composer, he appears as an absolute truth-loving genious. In many of his writings, however, he comes across as a fanatical egoist, a brute, with a giant inferiority complex. As a pragmatic theatre man, he was a dazzler and a seducer, a hypnotist who held to the same manipulative methods the powerful have always made use of – quite contrary to the wisdom that his music theatre actually emanates. In other words, Wagner is asynonym for what one might call idealism’s paradoxical dialectic! What relation do you have to Syberberg’s Parsifal? I saw, and discussed, this film as part of my studies at school in Hamburg. As an opera film - a genre that for me stands out as a stepchild - Syberberg’s contribution is pioneering and otherwise exemplary. It utilizes film art’s unique opportunities of viewing the transition and transformation at a surreal level, independent of the opera medium’s constraints: Syberberg removed himself completely from theatrical naturalism, in contrast to, for example, Zeffirelli’s opera films. The first act of your production of Parsifal was intensely Oedipal, but this became progressively absent in the second and third act. Why? Because there is a development in the work. Parsifal goes through an individuation process that enables him to realise and carry out his task. The outline of the plot is brilliantly synthesized by Wagner, with an incredibly long, suspenseful build up - albeit with very long passages where Gurnemanz looks back in time and tells of the prerequisites for the Grail Knights’ salvation - before Parsifal himself arrives on stage. The second act is of course the big theatrical act, with rapid and highly dramatic turning points in music and action, until the high point is reached with the destruction of Klingsor’s domain. In the third act, the consequence of Parsifal becoming an empathic and responsible human is ritualised and sublimated. But must Parsifal first break away from his mother? It is only one stage, but an important requirement, yes. The action in Parsifal is played out in a rigid patriarchal environment. Aside from the Flower Maidens in the second act, Kundry is the only female figure. Kundry is split and forever condemned to move back and forth between tremendous extremes. As a woman, she represents that which the Grail Knights with all their power suppress in order to remain clean and worthy of receiving the Grail’s graces. A paradox indeed, as the Grail also symbolizes femininity. How was your concept constructed and how does such a working process function? 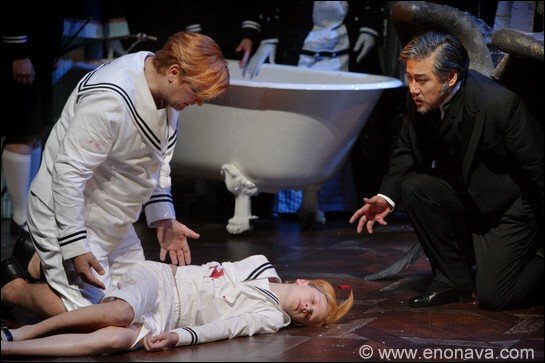 What happens to the boy Parsifal? He is a fatherless boy who childishly sets out into the world to conquer everything and everyone, until he is overwhelmed by the trauma that slumbers deep in his subconscious: his bond with his mother, whose death he is responsible for and which he has repressed. By using this theme of regression, Wagner was a step ahead of Freud's psychoanalysis. Today, this strong Oedipal undertone becomes strangely didactic and unwittingly comical if the staging doesn’t represent more than a complaining and whiny tenor’s guilty conscience over his mother. The Grail serves as an oracle. According to the prophecy, only "der reine Tor, durch Mitleid wissend" (the pure fool, made wise through compassion) can rescue the Grail Knights. Their society is about to collapse and they are threatened by dangers that reflects their own intolerance, their suppression of sexuality and the way in which they compensate for their own fear and impotency. The Grail announces a savior, one who can redeem them and himself from all guilt, and thus protect the Holy Grail from being misused. Can you specify what the other pillar of your concept represents? The central theme of guilt and salvation has many political aspects. Our Western, Christian culture has always glorified the figure of the sovereign leader, the guide who ensures the country's honor and the people's prosperity. Wagner’s romantic political idea of a "republican king" was part of his inner crusade against Bismarck's German Realpolitik, which he deeply despised. Germany had just been gathered into a great empire under Wilhelm the First’s rule, and there were strong nationalist and imperialist movements throughout Europe – and also through Richard Wagner. But there was little interest in Berlin in the eccentric theatre composer, and it was the "Fairytale King" and castle builder, Ludwig II of Bavaria, who was Wagner's supporter in his somewhat incredible plan to save the people from politics through artistic renewal. Ludwig funded both the erection of the Festival House on the green hill above Bayreuth and Wagner's villa "Wahnfried" in the city's castle garden. Der Ring des Nibelungen received its first performance in 1876 and the growing circle around Richard and Cosima Wagner took to increasingly bizarre means in its stylized homage of the art prophet. Richard himself was wary of many of the tendencies that the cult around him took. But after the lean years of the 1840s in Paris, Wagner had learned how he had to market himself, his oeuvre, work and reputation to secure a position within culture and politics. He used every means available to consolidate the image of himself as the greatest, most German artist of all time. And, undoubtedly, this he was - for better or worse – as far his life's work really reflects the 19th century as the most desperately revolutionary era in our cultural history. Wagner led a harrowing life in a revolutionary climate, and I think you can only understand a work like Parsifal if seen from the tremendous spiritual confrontations that the highly sensitive childlike soul Richard Wagner was exposed to at an early age. His productivity, creativity and unbreakable will appear almost superhuman, and testify that the salvation he thematized also drove Wagner the man. Can you be a little more specific about how you tell the story of Parsifal on these three different levels? How do you start the story? The story is actually told in quite a linear manner, but the progress is larded with period colour, references and associations that, depending on how receptive you are to this, fortify and sustain the music’s suggestive power. Parsifal, a young boy in Wilhelminian Germany, is seen here as an image of the young kingdom that longs to take part in the great game of power in the world. In the prelude we see the boy at the deathbed of his mother, Herzeleide. The scene takes place in a room that resembles the salon in Wagner's villa "Wahnfried". A portrait over the fireplace portrays Herzeleide posing martially as "Germania", the allegory of the old, proud kingdom, painted by Kaulbach in 1914. Weakened, Herzeleide attempts to subdue her son's restless spirit and embraces him fondly. But he breaks away from her and runs off playfully into the garden, whereupon Herzeleide dies of grief. In the second part of the Prelude, the young Parsifal is seen building a castle of stone on the prompt box, which we have dressed as Richard and Cosima's grave in Wahnfried. This takes place to the clearly presented religious motif now unfolding broadly symphonic in the orchestra. 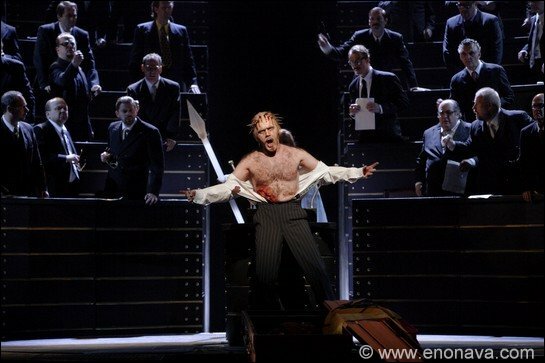 The scenario begins to grow while Parsifal entrenches himself in his own fortress against the threats from the outside. 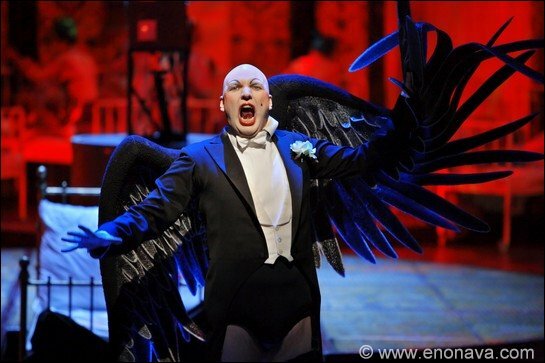 But, then, to the modulated repetition of the Grail motif from the start of the prelude, Herzeleide returns to life again as a kind of Eros-Thanatos demon. She lures the boy to her, embraces him and drags him down into a subconscious world through the bed. When he wakes up he finds himself where the story is taking place: "In a forest clearing near the Grail Castle" - in our case none other than in Villa Wahnfried´s garden, where Richard and Cosima Wagner lie buried. The first act is told as a dream-like time travel from the 1880s (Parsifal was first performed in 1882, Wagner died the following year) and until the outbreak of the First World War in 1914. In the same year Bayreuth lost its monopoly on performances of "Parsifal", which quickly spread to all the opera stages of Europe. But these are all dramaturgical motives for the direction, which do not necessarily have to be understood in order to experience the drama at an elementary story level. How do you place Kundry in this game? As mentioned, Kundry represents and reflects several aspects of a completely male-dominated, eternally suppressing view of women. We dress Kundry in various costumes that clarify her various roles at the different stages in Parsifal’s individualization process. This is of course present in Wagner's view of his own relationship to women, to his mother and his wife, Cosima. And in connection with the time travel, we also come to Wagner's children and grandchildren - to Winifred and all "Kundries” who have managed the Wagner family inheritance. 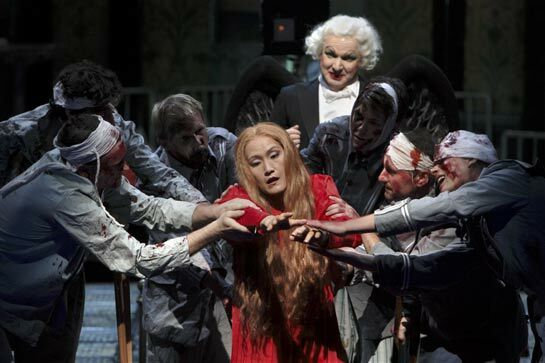 In the show she acts as nurse and maid, as the reincarnation of Parsifal's mother, Herzeleide, as "hell rose", as a soldier bride à la Marlene Dietrich and as a female version of the perverted Christ figure represented by Amfortas with his unhealable wound. It is impossible to identify with Kundry as a real woman as she is a projection for men who fear women. She doesn’t identify herself with anything other than her own curse, and there is little purpose in analysing her psychologically as an individual. She appears always as the other, the strange and the dangerous - that which man has made woman into in order to stand over her. Since Eve's sin she is punished for her disobedience to the One True God - the male, of course. But still, the political emancipation of women is not really the issue here. Far more, this is about the search of a solution to Adams's own problem, having eaten from the Tree of Knowledge. Wagner regarded the need for women's liberation as only one of many symptoms of the evil he believed poisoned all interpersonal relationships. Richard Wagner himself behaved as a patriarch and took the most incredible freedoms, also privately. At the same time, he was influenced by the time’s narrow-mindedness and fear of sexuality, which he sublimated artistically. The Grail Knight, Gurnemanz, is also a problematic figure. You have to some extent chosen to show scenically what he relates. Is it because you think his long retelling is boring? Gurnemanz is not an old gnome who sits and reads from a book; he is a man with a huge problem that he compensates by recapitulating and rewriting the story in his head. The form of retrospective self-examination that Gurnemanz engages with in his long stories may seem stagnant, but the music is rich in color and dramatic images. His problem is that he was present when things went wrong, not beeing able to prevent it. Where was he when Amfortas was seduced by Kundry, and pierced by Klingsor with the Holy Lance? He was, of course, seduced himself and lying in the arms of one of Klingsor’s Flower Maidens. Ever since then he has been consumed by guilt and lost in his own double standards. This becomes quite clear when you study the score and look more closely how Gurnemanz avoids questions, how he treats Kundry and how he deifies his royal heroes, Amfortas and Titurel. Gurnemanz is pursued by these ideals and longing for somebody errating all their sins and errors. Recapitulating and sublimating the painful moment of defeat, he continously circles the bed, forcing himself and others to live in the illusion of sovereignity through pure chastity. By this, he resembles characters by Ibsen. And in many ways he seems to defend aspects of the obscure wagnerism, something I tried to emphasize scenically in this production by showing him as a servant in Wahnfried, an official for Wagner's art in "Sanctuary". I pictured Anthony Hopkins in the film Remains of the Day - an association which also helped the singer Kwangchul Youn to bring Gurnemanz’ character to life. A problematic and disturbing scene is the baptism scene in Act 3, seen from the perspective of Wagner and his group of anti-Semitic friends believing that Jews should receive baptism and be converted to Christians. What role does Kundry play as "the eternal Jew" in your concept? Kundry is, of course, an Ahasuerus figure, in the same tragic way as the Dutchman, who is saved through Senta’s self-sacrifice. But with Wagner, this is primarily a psychological and not a political issue. Surely enough, the baptism sequence - with its "annihilation music" - and Kundry's final death seems quite horrific given the background of Wagner's antisemitism. But also in this context, you have to see and distinguish the significance in light of Wagner's holistic, artistic ambitions and his time. Wagner was completely taken with Schopenhauer’s philosophy, which celebrates "das selbstlose Wohlgefallen", i.e. a selfless well-being, which can only occur when one breaks with the will of life that makes people unfree in word, thought and deed. Thus, a variety of Buddhist ascetic teachings? Yes. But the absolute freedom of thought in Parsifal, Wagner's idea that the Saviour himself must be saved from his need for salvation must first be aimed at the composer's own motivation and ego. The Protestant Wagner was obsessed with the idea of justifying his own existence and artistic work. In this context, anti-Semitism is thus as little relevant to Wagner's work as women's liberation. No matter which category Kundry is assigned to and what ever name she obeys, she must be saved, as her existence manifests a world order based on segregation, dissossiation, projection and fear. It is actually this "impurity" Wagner wants to eradicate, not real people behind gender-specific, ethnic, religious or cultural categories. Wagner reworks many rituals, for example, the Eucharist, to emphasize that its original and pure meaning has been lost. He rejects any traditional liturgy in favour of his own dramaturgy. Like Ibsen's Brand Wagner also encourages an uncompromising "be yourself, fully and completely, not bits and pieces". By taking liberties with all art conventions, Wagner managed to realize himself, apparently totally independent of everyone and everything. But, of course, only artistically. According to Adorno, “art is magic, freed from the lie of being the truth”. For me, Wagner's art realizes this claim, precisely because his work creates and fulfills itself on its own - artistic, not realistic - conditions. Then for you there isn’t very much of "Hitler in Wagner”? Wagner was a role model for Hitler. As important as understanding how and why, is to realise that Wagner's work actually did not serve as propaganda for Hitler and Nazi racial theory, simply because the work's core deals with a concept that in no way correlates with Fascism: pity! It is no coincidence that Hitler forbade performances of Parsifal during the war. When it comes to "interpreting Wagner politically correctly", it is most important for me not to give clear, simplistic answers, but to offer complex and suggestive options leading to questions. Today we hear Parsifal with other ears and other historical assumptions than the audience Wagner turned to in his time. That's why I chose also to play the entire third act - which I placed in the period immediately after Nazi Germany's downfall - in a scene on the stage, where all that unfolds must be regarded as a drama within a drama. Likewise, the audience is encouraged to take a stance on its own role and function in this game. And possibly distance itself from it. At the same time, this refers to the scurrilous situation in Bayreuth after the war: Richard's grandsons, Wieland and Wolfgang Wagner feared that their attempt to de-politicize the festival with an abstract style of direction in their "New Bayreuth" wasn’t sufficient. They therefore requested the public to avoid any hint of discussion of political content by hanging up posters in the entire Festival area with the appeal: "Hier gilt's der Kunst!" Today, barely 60 years later, it seems almost grotesque that Bayreuth was ever about anything but art. Just as grotesque as denying the political aspects of any public action. Do you think it is right, as for example with Wolfgang Wagner allowing Kundry to reveal the Grail, and letting her survive? In doing this Wolfgang Wagner showed two sides of a coin: the woman behind Kundry finally united with her own symbol. It gave her the opportunity to participate and be included in a community free of mythification, abuse, division and repression. In my staging, Kundry also survives, but it works on another level, where the singer is released from her role. The same happens with Gurnemanz. Together they unite outside the game and with their embrace as a symbol of reconciliation, the boy returns. A new generation is thus released who must take a stance on the cultural heritage beeing administered as a source of identity. Before this you show Parsifal as Christ in the Bundestag, surrounded by the Grail Knights dressed as modern politicians. At the end, the audience see themselves on stage in a large mirror, illuminated by a bright dove. Is this meant to be ironic? This specific use of theatrical means conveys sharply contrasting, symbol-laden images and are ment to emphasize the tensions and contradictions that has been articulated throughout the piece. The Grail appears in several different forms in this production. 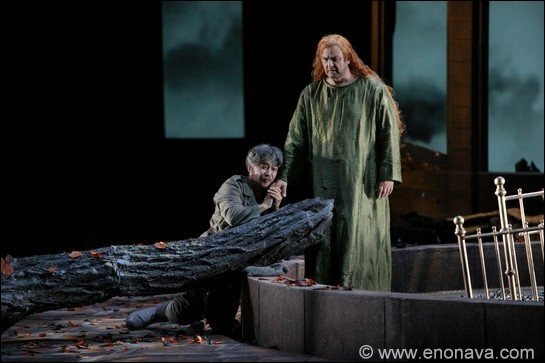 At the end Parsifal disappears into the mythical depths, down into the heart of the national eagle - the symbol of German national communality, which still preserves and considers this work to be an identity-forming, cultural heritage. This collective consciousness has many wounds. The audience participate in an artistic process that eventually suggests salvation by dissolving all dissonances in an ascending triad. To theese sounds I wanted the boy to reappear as a sign of today's future in Germany, with a father and mother at his side, beeing released from a highly ambivalent drama. And when the music ascends ultimatively and we see ourselves reflected in a round mirror on the square stage that we have stared at for hours, sitting in a darkened theatre, we are "Enlightened", beeing reflected by this theatre which thus throws us back on ourselves. But who is the Savior? Longing for the Savior is something perennial that we must learn to live with. Salvation can only come by, with and in ourselves. I believe this is what this theatre gives us a chance to feel, understand and to take responsibility for. From this perspective, the theater is my temple.